Being a victim of crime can be a difficult and stressful experience. Reactions such as fear, anger, confusion and anxiety are all feelings common to victims. The Victim Service Section was established in 1982 to assist victims of crime and/or tragedy and their families by providing support, information and referrals to community support agencies. Crime victimization may leave victims, families and friends in a state of turmoil. Not every person has the same reaction. People may have a varying range and degree of reactions to being impacted by crime and these are referred to as “normal reactions to an abnormal event. Understand that coping through the process to get back to normal, can take time and can be difficult. Learning to understand some of the normal feelings and reactions victims may experience can be reassuring and helpful. Taking steps to getting back to normal is important, and can be a difficult process for both the individual and their families. Learning to understand the emotions of victimization can help people cope with their feelings and deal with the traumatic event. Victim Servicesis dedicated to helping victims of crime. We are committed to giving victims timely and accurate information and referrals. 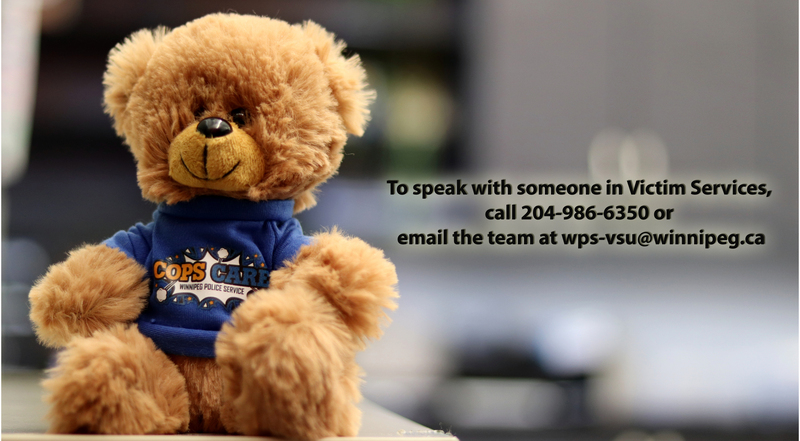 Victim Service is comprised of the following: a patrol sergeant, constable, social worker and a volunteer coordinator. In addition we have approximately 40 volunteer caseworkers who reach out and contact those impacted by crime and tragedy. Court orders & what they mean. Ensuring victims are aware of their rights as legislated by the Manitoba Victims Bill of Rights and the Canadian Victims Bill of Rights. The Victim Service Team is comprised of (1) social worker,(2) Police Members,(1) Volunteer Coordinator; and approx. 35 Caseworkers (Trained Volunteers). A listing of telphone contact information for victims of crime. We all have a role to play in crime prevention! By working togethery, we can reduce crime in Winnipeg. Find out about becoming a Victim Services Volunteer. Find out about becoming a Community Volunteer. Find out about some of our Amazing Volunteers and why they are involved with the Victim Services Volunteer Program. Family Guide; Support for Families of Homicide Victims or Missing Persons where Foul Play is Suspected. "An Internationally Accredited Law Enforcement Agency"